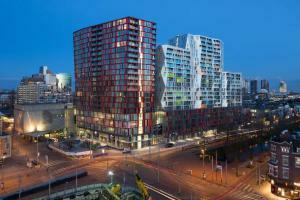 The apartment complex Calypso is located in the heart of Rotterdam. Spectacular and colorful complex with 408 apartments, offices, shops, a car park and facilities in the plinth. The housing is a mix of owner-occupied and rental housing with a large variation in house size and type. In the tower with red façade, located on the Theatre Square opposite De Doelen, are a quit some furnished apartments for rent variated from 1 to 3 bedrooms and all with a balcony. The main entrance to the complex at the Mauritsweg is a beautiful atrium with a service desk, meeting rooms and a communal gym. All rental apartments have a luxury establishment level. This complex with brand new apartments means comfortable living at high level in the heart of Rotterdam. Given that most companies are located in the center of Rotterdam, these are very popular apartments among expats. Please contact our office to see our available Calypso apartments.